The Universe is big. Really big. The observable universe extends from the Earth to the horizon of the cosmic microwave background. When the light of the cosmic background was emitted about 13.8 billion years ago it was only 42 million light years away, but because of the expansion of the Universe that horizon is now more than 46 billion light years away. Using that definition, the known universe is about 93 billion light years in diameter. As large as that is, it’s only the portion of the Universe we can observe. The total Universe extends beyond our horizon. Just how far it goes is an interesting question. 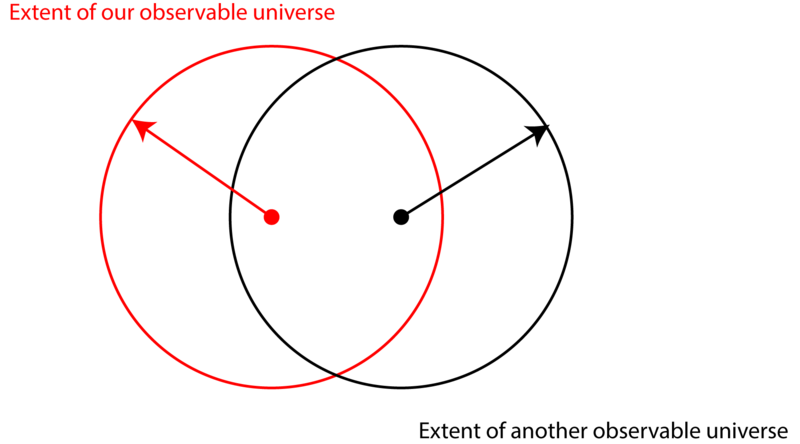 A flat universe implies that distant observers also see a homogeneous universe. There are indications that the Universe extends far beyond what we can observe. The universe we see has a fairly uniform distribution of matter. Sure, matter clumps into galaxies, and those galaxies clump into clusters of galaxies, but on a scale larger than about 300 million light years those clusters appear randomly distributed. In other words, it is homogeneous and isotropic. If what we observe were the extent of the universe, then we would be basically in the center. Since we see about the same amount of mass in all directions, the gravitational pull from all that matter would basically cancel out. But for a galaxy on the edge, it would see a great deal of matter in one direction and basically nothing in other directions. Gravitationally it would be pulled toward the center of the universe. Because of dark energy this universe wouldn’t collapse upon itself, but it would mean that galaxies would tend to clump toward the center. Since gravity is a curvature of spacetime, this would distort the overall shape of the universe. What we observe, however, is that the Universe is flat. At the very least this means an observer at the edge of our horizon must also see a homogeneous and isotropic universe. Given the flatness limit that would mean the total Universe is at least 400 times larger than the observable universe. Two regions of space can’t be thermally connected. But it could be much larger. Another point of evidence is the fact that the cosmic microwave background (CMB) has an almost perfectly uniform temperature. There are small fluctuations of temperature throughout the background, but the overall temperature is the same in all directions. The thing is, it shouldn’t be. 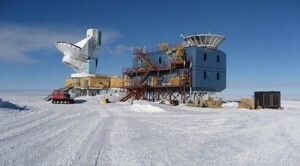 The CMB was emitted when the universe was about 380,000 years old. At best, that means that only regions of space within a radius of 380,000 light years would have any way to reach thermal equilibrium. For anything more distant, there simply wasn’t enough time for the regions to communicate, even at the speed of light. When we look at the cosmic background in different directions, we can see different regions that couldn’t have reached the same temperature. They were simply too far away from each other. And yet, they have the same temperature. What gives? The dominant idea is known as early inflation. 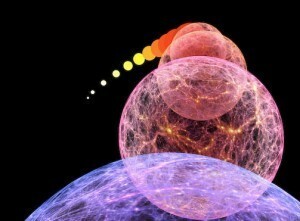 Basically, a fraction of a second after the big bang the Universe entered a short period of extremely rapid expansion. In a brief moment the Universe expanded by a factor of 1060 before settling down to its current rate of expansion. While we don’t have direct evidence of early inflation, it does agree with several observational aspects. 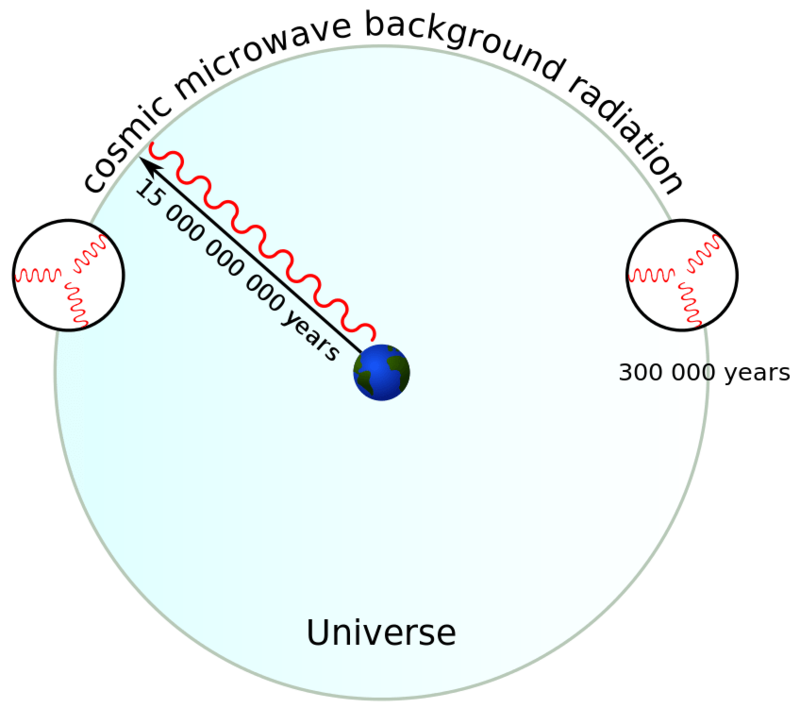 According to the inflation model, the observable universe was roughly the size of a quark before early inflation, and about the size of a grain of sand afterwards. If the size of the total Universe before inflation was the distance light could travel since the big bang, then the current Universe is about 1027 larger than the observable universe. In other words, comparing the observable universe to the entire Universe is like comparing a grain of sand to the observable universe. It could be much larger, perhaps even infinite. 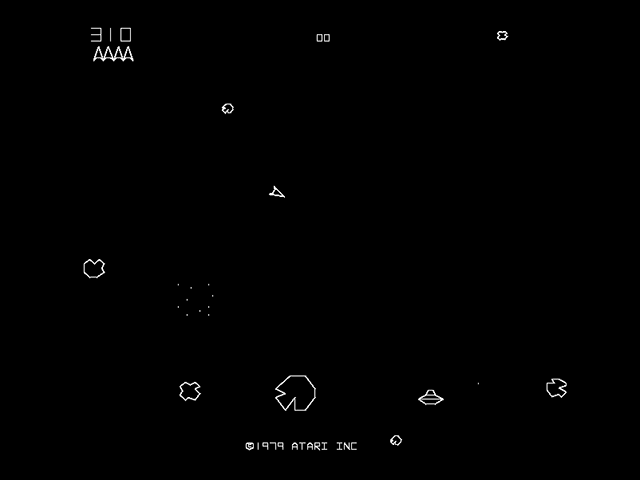 The game Asteroids is a closed universe where you can travel in one direction forever. Of course all of this assumes the cosmos doesn’t have some kind of strange topology. Since space and time can warp and weft, one could imagine a universe that loops around to itself, being finite in volume, but infinite in distance. Imagine a cosmic version of the surface of the Earth. It has a finite area, but due to the Earth’s curvature you could travel in a particular direction forever, simply looping around the Earth over and over. In cosmic terms that would mean a beam of light traveling through space would eventually find itself back where it started. If the Universe were closed and smaller than the observable universe, we would expect to see multiple versions of the same galaxies. There have been studies looking for periodic fluctuations in the cosmic microwave background that would indicate such a closed-universe effect, and they’ve found no evidence of such a thing. If the Universe is truly closed, then it must be at least 78 billion light years in diameter. Of course there is no reason to presume the Universe has such a closed topology, so that lower bound should be taken with a grain of salt. So the short answer for the size of the Universe is that it’s huge. Likely very, very, very huge. Possibly infinite. 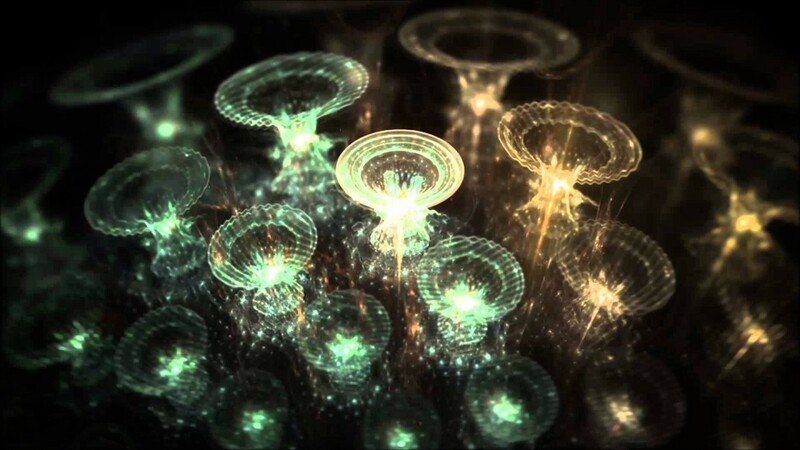 In my opinion you have the microcosm and the macrocosm which is winding infinitely deep through this mobius twisting Mandelbrot set of chaotic energy and that chaos is just the unexplained phenomenon which is nature. Hi just a question to anybody here really: How can we be sure that very far galaxies aren’t gravitational attracted to a particular direction within the universe? For example, if we observe a galaxy cluster 8 billion light years away (away by the meaning as long as it took for the light to travel to earth) then we see its position 8 billion years ago. If that cluster and any cluster close by would have been pulled into a certain direction since – how would we know? I’m not saying that this is the case – I just don’t understand how we can map the universe as a whole over scales bigger then 300 million light years if everything we see beyond is at least how it used to be more then 300 million years ago. Individually we wouldn’t know, but statistically if galaxies were pulled in a particular direction we’d see it in the overall statistics. As an example, the great attractor was originally found this way, by looking at the motion of lots of local galaxies. Which came first – inflation or the big bang? As I have lerarned it was inflation before big bang, which is of a certain importance for the modelling. You cannot get to infinity from finite, so the universe isn’t specially infinite unless it started that way. Also I thought it didn’t matter where you were, you were the center of your universe, no such thing as being near an edge of it. That guy on that planet 10 billion light years away just sees a different spherical chunk of the vast larger universe you nicely explained. Maybe someday you can explain how 1 through 3 were derived, and answer 4. Thank you. 3. If the Universe is truly closed, then it must be at least 78 billion light years in diameter. 4. Is not closed and flat inconsistent? 1. The flatter the observable universe, the larger the Universe has to be. Given the limits we currently have it gives a value of at least 400. 2. Current models of inflation estimate the Universe expanded by a factor of 10^60 in the early inflation period. It’s just a simple matter of calculating how far light could travel before inflation, then multiplying it by the inflationary factor. 3. Again, since no repeating patter has been found in the CMB any pattern must be at least larger than that. If it were smaller we’d see a pattern. 4. It’s not because of fun topology. I wrote about it here. The idea of a “closed” or “finite” universe does not make sense to me. Then what is outside of it? Sir: Beyond The Universe should be Beyond Our Universe. How the word universe is used is probably confusing to some. I use “The Universe” & “our universe”. The Universe is infinite. Our universe is not infinite. Our universe has size, it had a beginning and will have an ending, time exists, distance exists. But, The Universe has no in, no out, no size, no time (only its parts have size and time), it has always existed, will never end. Humans will never be able to discover what exists beyond our universe. how about the spooky action at a distance and time? quantum stuff is never mentioned in this article though somehow can it be ignored? seems weard. in another article you said the big bang happened everywhere thus if the universe is expanding we can conclude is not only expanding in space but also in time thus maybe this expansion we just observe it as distance and we do not actually measure the time. am i making any sense? it is a space time thus it must expand in both. how can the universe be flat, expand in the same time and there is no center? seems kind of strange theory. would be like you stretch some paper but all particles will believe they are the center? but big bang theory does not give any center right? how can the flat universe explain the black holes? That’s to say the universe is flat, perhaps it’s curving. Here is a quote I just found on space.com about the shape of the universe. This is why it leads me to believe it’s more like a möbius strip twisting infinitly. If you follow the curving path of a mobius strip it appears your traveling in a straight line along a flat surface forever, when actually your traveling along a curving path indefinitely. Not to be rude by double posting but I just found a shape called the “umbilic torus” which is like a mobius strip and torus at the same time. Maybe the universe is shape like that. I have a problem with dating the universe the way we do is that… we date the universe as the furthest light we can see, like Hubble Ultra Deep Field 13+ billion light years – hence 13+ billion years old equals the universe. If it take light 1 billion years to reach something during that one billion years space is expanding so the point at wich it originating is father back now so even though it took 1 billion years to get here it would take a lot longer to get back. So that’s how two Galaxy’s can be over 13.8 billion years apart. Has there been calculations of how fast the Universe beyond the CMB is expanding outwards and how fast it is being swallowed by the CMB expanding into it? Also, wouldn’t the existence of galaxies beyond the CMB be the reason we see galaxies that appear to be formed so soon after the Big Bang. Because these are galaxies that formed beyond the CMB and have since been overtaken by the CMB expanding into it? The universe is beyond science. This can be realised only through meditation and not physically as we all think. So… What is there beyond the Universe? Could there be a totally different dimension not bound to what we, in our limited understanding of space, know as time and space?